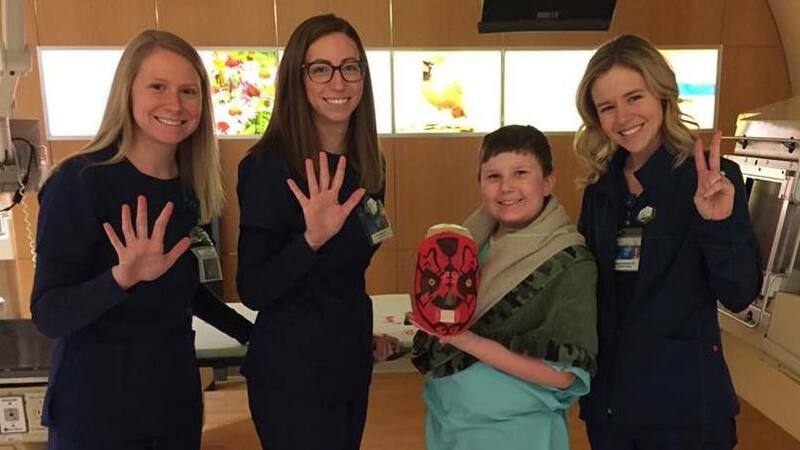 Stop by the Proton Beam Therapy Program at Mayo Clinic and you might see a superhero, unicorn or mermaid, thanks to the artistic talents of staff who have begun painting masks for young patients receiving treatment. When Jack began proton beam radiation treatment, his mask — a firm, plastic mesh device designed to keep him still during the targeted therapy — looked the same as every other patient's. But midway through his treatments, staff at the Proton Beam Therapy Program offered to paint it. "We saw on social media that other centers were painting masks for kids," says Jennifer Deweese, a radiation therapist at Mayo Clinic. So she and her colleagues decided to unleash their inner Picassos, too. In addition to Darth Maul, they've created Pokémon characters, a unicorn, a mermaid, a Minion and various superheroes. "Every kid wants something different," Deweese says. And the care team is happy to oblige. The masks may look different on the outside, but they've had a similar impact on the insides of young patients like Jack. "Decorating the mask to the patient's preferences changes the mask from 'that thing they make me wear' to 'my mask,'" Randy Mc Keeman, a Mayo child life specialist, tells us. "That is a huge difference in the way the child sees the whole procedure." It's a difference Deweese has seen firsthand. "Now kids are kind of excited to put their masks on," she tells us. "Wearing the mask seems less intimidating if the child gets to pick out what they want it to look like." And she says kids aren't the only ones who benefit from the artsy addition to treatment. "It's fun for parents, and rewarding for the people who paint the masks." While there's no prescription for a painted mask — at least not yet — there's no doubt the gesture is good medicine for the young patients. "The mask painting helps to transform a fearful thing into a fun thing," Mc Keeman tells us. "Pediatric patient needs are different than adult patient needs. As part of the Child Life team, our work is to hold up those different needs and make sure we are meeting those needs." Mission accomplished, according to Heather Jelsma, whose 8-year-old son, Devin, recently completed proton therapy. 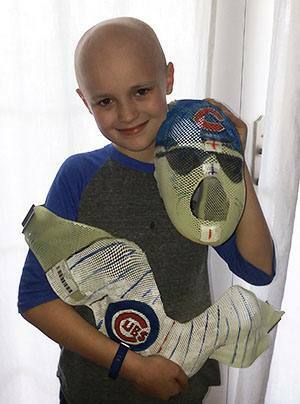 The Chicago Cubs fan often wore Cubs T-shirts to his appointments, a fashion choice that didn't go unnoticed by staff who turned his mask into a Cubs player. "Everyone at Mayo was so friendly and so caring," Heather says. "They get to know you as a person. They found a way to personalize Devin's mask. It wasn't just some cool character. They painted something that meant something to Devin." Hit a home run by leaving a comment below. Then use the handy social media tools atop this page to share this story with others. Learn about Mayo Clinic Children's Center.